Peak Property Management is the perfect case study for a company who improved their business — simply by updating their site. 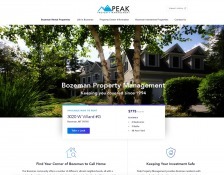 In a high-octane rental market, Peak Property Management in Bozeman, MT is finding their edge against competition with a website overhaul. During our planning and vision discussions, many of the features we discussed with them would benefit any administrative offices in the property rental agency industry. Here are a few ways we are helping Peak Property not only attract new customers, but also make life easier for their staff. Tenant Portal — Renters are more often than not, busy people. They have jobs, school, pets and children to feed and errands to run. Having to drive across town to drop a rent check in the mail or at an office can add to that to-do list. A tenant portal allows tenants to log into a secure area to view their balance, pay rent and submit maintenance requests. In this case, Peak Property’s website will link to a third-party portal, Property Boss, with the potential to update to a custom portal in the future. Offering a tenant portal will cut down on the hassle of late payments and make your rental agency more desirable against competition who do not have this capability. Pre-Approval Process — Property managers use applications to gather basic information and pull credit reports on individuals looking to rent. On their new site, we encourage users to use this pre-application process where it seemed helpful, so that Peak staff receives less phone calls from potential tenants who have not yet completed this process. Automated Mailer — The automated mailer for Peak Property will serve three primary markets: property owners, tenants and potential tenants. Property owners will be kept up to date on the status of their investment. This way, they can make the decision to raise or lower rent, add amenities, or adjust their listing in other ways that may attract renters. For tenants, the mailer will also serve to notify tenants of important announcements. Potential tenants who have used the site’s saved search feature will receive daily or weekly emails showing available properties that fit their desired criteria. Because the mailing system will be automatically generated from existing site data, it requires very little staff time. Education — Like many businesses, Peak Property staff spend an exorbitant amount of time answering phone calls from people with the same questions over and over. The new website will feature helpful information sourced from a list of frequently asked questions the company has accumulated over the years. We plan to organize this information into categories aimed at the needs of renters, students, and parents of students. It also includes community information: bus schedules, bike paths, Montana State University information and statistics about on-campus vs. off-campus living costs. This resource will save Peak Property staff from constantly answering phone calls or emails so that they can work on more important things. Investment Properties — In addition to managing rentals, Peak Property is licensed to buy and sell real estate. Our Digital Marketing team found some significant keyword optimization opportunities in this industry. We plan to build Peak Property an Investment Properties page and link to their listings on Windermere as well as write content that focuses on these underutilized keywords. In addition to theses features, a website overhaul also updates the overall design and content to better represent Peak Property’s business, and the site will now be designed to perfectly accommodate any mobile device. We are excited to be underway on this new project! If you are in the market for an website overhaul, talk to us about getting half off — or any other questions you may have.